Terms & Conditions: This gift card is usable up to balance only to purchase goods or services at any IHOP® restaurant in the U.S. and Canada. Not usable to purchase gift cards. Card is not redeemable for cash unless required by law. This is not a credit or debit card. Safeguard this card. It will not be replaced or replenished if lost, stolen, damaged or used without authorization. IHOP TPGC, LLC or the Franchisee of the independently owned restaurant where card was purchased is the card issuer. IHOP TPGC or Franchisee may delegate its issuer obligations to an assignee. Purchase, use or acceptance of card constitutes acceptance of these terms. 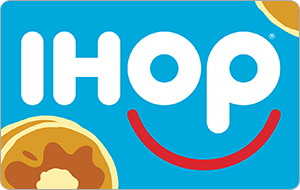 For remaining balance or other inquiries, go to ihop.com or call 1-855-316-7063.